My Taste Tester and I spent Saturday doing outdoor chores and enjoying the Kentucky Derby. What better way to enjoy the Derby than to make a dessert? We chose a recipe I found on the internet a while back. 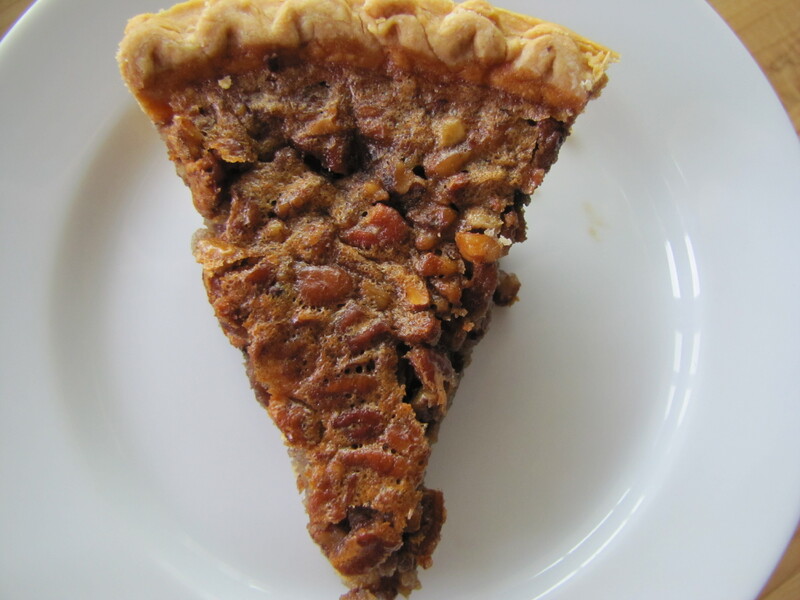 I had never made a pecan pie before so I don’t really have anything to compare this one to, but my Taste Tester has eaten several pecan pies in his day and said this recipe is a keeper. The chocolate compliments the sweetness of the filling by adding an extra dimension of flavor. I also added 1/2 cup toffee chips but they were not noticeably detected so I may leave them out next time. We cheated and used a frozen pie crust (partially baked first) but doing so allowed us to be enjoying this pie in under an hour. I had some extra filling so i filled up a 4 inch ramekin and baked it for about 30 minutes as well. 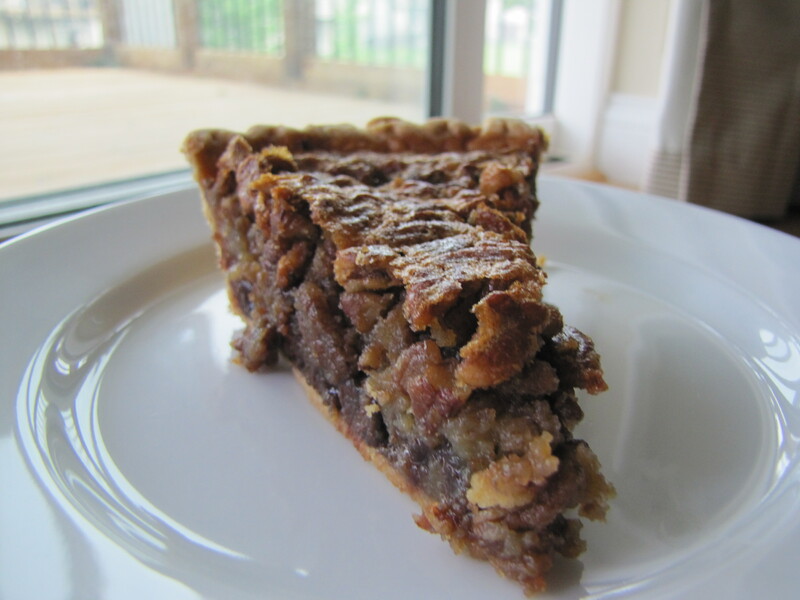 If you are looking for a great pecan pie this is a keeper with or without the chocolate chips I am sure. I would suggest eating this pie warm as it is best with the chocolate being melted and gooey. In a large mixing bowl, on medium speed with whisk attachment, whip butter, sugars, corn syrup, eggs, vanilla and bourbon together until frothy. Gently fold in the pecans, chocolate chips and toffee if using. Blend well. If you are a reader of my blog you know that I am not a ‘pie’ person, you can tell this by the lack of pie recipes on this blog. The only pie I have ever really enjoyed is pumpkin pie at Thanksgiving, not sure if it is the holiday spirit or the high from overeating turkey, stuffing and taters, but that pie just hits the spot! I decided I wanted to give pie a chance and thought the best bet at finding a recipe I would like is if it involved peanut butter and/or chocolate. I have had this recipes forever, I really have no idea where it comes from so email me if it is yours and want credit. This recipe has been on a piece of scratch paper taped in my recipe binder just begging to get made, in fact, it has so many stains on it it looks like a casualty of war. Poor thing, I felt sorry for neglecting it and whipped it up. Boy am I glad I did. It was so super simple to make and I had it whipped up and in the oven in 15 minutes! A quick 25 minutes later and this baby was ready. I used a pre-made pie crust this time for a couple reasons. 1. I was lazy. 2. I had one to use up. 3. I don’t like pie crust so don’t feel passionately about slaving over making one from scratch. I am bad, I know. Now you know my dirty little little shame. I hate pie crust. But, i couldn’t wait to dig into this fudgey little temptation. I allowed it to cool slightly before slicing up a piece. The flavor is rich and fudgy (but not too gooey) thanks to the cocoa powder and brown sugar. It tastes like a fudgey brownie baked in a pie shell (which is basically what it is). I must admit, however, that I may bake this without the pie shell next time (will it still be a pie then? if I use a pie plate?) I am just not a lover of pie crust and while I really liked this pie, I just felt the crust did not add anything. Maybe if I used a crushed Oreo crust I would feel differently. 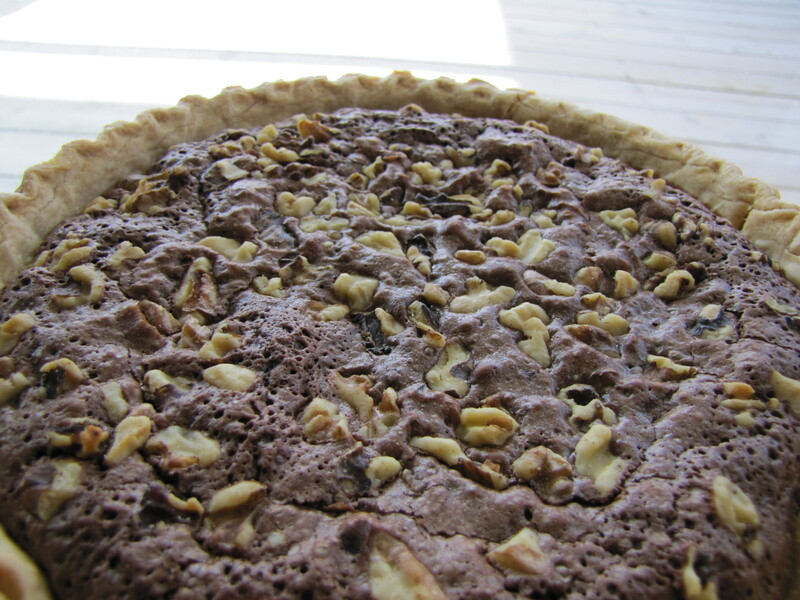 I loved the chocolate chips and walnuts throughout the pie, they provided a nice flavor boost as well. I must say that the best way to enjoy this is warm with a scoop of vanilla icecream and some hot fudge. 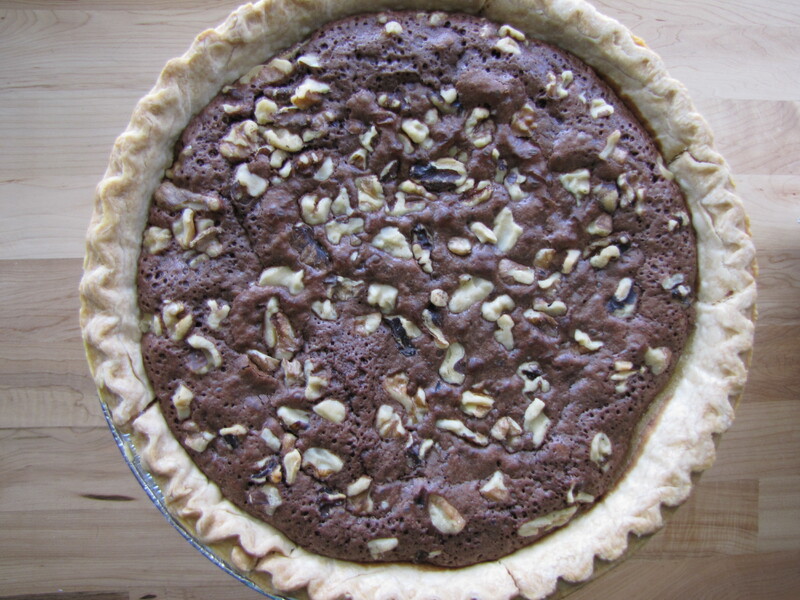 If you like pie crust and brownies than this pie is for you. If you don’t like pie crusts than give this filling a try on its own or with a different crust like I might. Either way, this was a great pie for me to wet my feet with. It is my goal to try more pies this summer……we will see. Melt butter, brown sugar, sugar and chocolate chips in double boiler over hot water. Stirring until smooth. Cool and add the eggs. Mix the flour, cocoa powder, chocolate chips and walnuts in a bowl. Add tot he chocolate mixture and stir until blended. Add vanilla and stir to combine. Pour into pie crust and bake for 25 minutes. Cool and serve. * I par-baked my crust for 10 minutes so it would not get too soggy in baking.